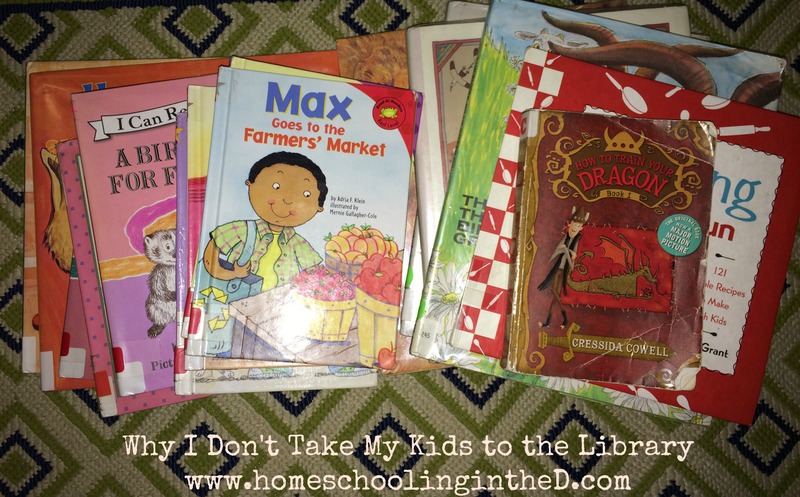 Why I Don’t Take My Kids to the Library – Homeschooling in the "D"
I was listening to one of my favorite podcasts and the guest on the show was talking about a topic near and dear to my heart: Going to the library. Just typing that makes my heart flutter. I don’t know what it is about libraries, but I’ve always felt at home in every one I’ve visited. So, I knew that when I had kiddos of my own we’d be frequent library goers, meaning the librarians would know us by name and would probably give us a key to lock up because we’d be there so much. Enter my first born child, B. B is spirited child and loves to run, talk, and just be a typical boy. The library was a bit of a challenge for him from the beginning, but I was able to draw his attention fairly quickly because he was my only child at the time. At that point, library going was in full effect. Yay! Enter my second born child, Z. Now, Z is more mild-mannered than B however he does not have much patience for looking at books, being read to, or staying nearby while we’re out and about, and the library was no exception. Needless to say, library time with him was exhausting and, yes, pretty frustrating. After trying several times to take both to the library with me, I decided to quit cold turkey. The library had always been my sanctuary and taking the boys was turning it into a nightmare. From that decision on, I haven’t taken both of them with me (I have taken my eldest a couple of times), and I don’t feel a lick of guilt. I had to keep perspective on why I was there. It was to open their eyes and hearts to books and finding the best way to do that was top priority. These days, I have a bit of a different routine now that I go alone, which maximizes my experience all together, but my heart is hopeful that one day we can all go together once again. In their defense, I will say that I didn’t always have a plan when we all went together. Before I was just going in blind or with a bit of idea an idea of the books I wanted, but now I do my research ahead of time. This may seem like a no-brainer, but this girl wasn’t doing it before and it was creating a not-so-good time in the process. Now, I reference my book lists I’ve saved on Pinterest and elsewhere, check the library’s website to a) make sure it’s there and available to borrow and b) I write down its location so I can go right to it when I get there. Additionally, I reserve any book that isn’t available so that when it comes in I can pick it up at the drive-through window. Muy convenient when I do have the boys in tow, or when I’m super pregnant and don’t want to get out of the car. 😉 I’ve read that other mamas are able to reserve all of the books they want, available or not, and have them waiting at the pick-up area of the library. I don’t know if my library offers it, but I will be looking into that! All in all, at this time, the positives of not taking both boys with me to the library outweigh the negatives. Yes, I’d love for them to go with me however we’re not there yet. Ultimately, I think it’s more important that they have good books at their disposal than not, so Mama will continue her solo library time until the time is right for them to join me. For more awesome ways to use the library with or without kiddies ;-), check out the podcast I mentioned earlier here.